INSIDE/OUTSIDE is an installation and performance work for three choreographed musicians. 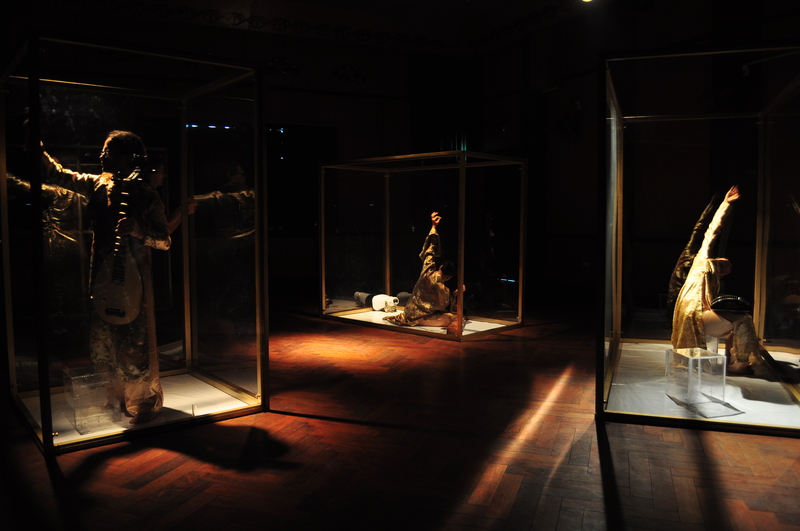 Initially, the spectators find three glass boxes, illuminated from different sides by spotlights in the dark room. In each box there appears to be a statue of a musician in traditional Vietnamese queen costume. When the audience moves through the space, the reflections in the boxes create a primary level of being inside and outside the boxes. You see yourself inside the box, and you see the performers reflected in each other’s boxes. Many questions may be raised by the scenario with the musicians, who eventually begin to play a cut up version reading of traditional Vietnamese music: What are these three individuals in traditional dress doing in there? Why are they here? Do they even have a visa to be in the country? Why are we watching these three Asian “women” inside glassboxes? What is the nature of the gaze coming from the outside? By the glass boxes you find headphones in which you can focus on the music played in a specific box. In the room is a constantly shifting soundscape of instrumental and electronic sound. The electronics and live-mixing is performed by the composer and improviser Matt Wright. Through these shifting layers that the audience can explore, yet another layer of inside and outside is created. 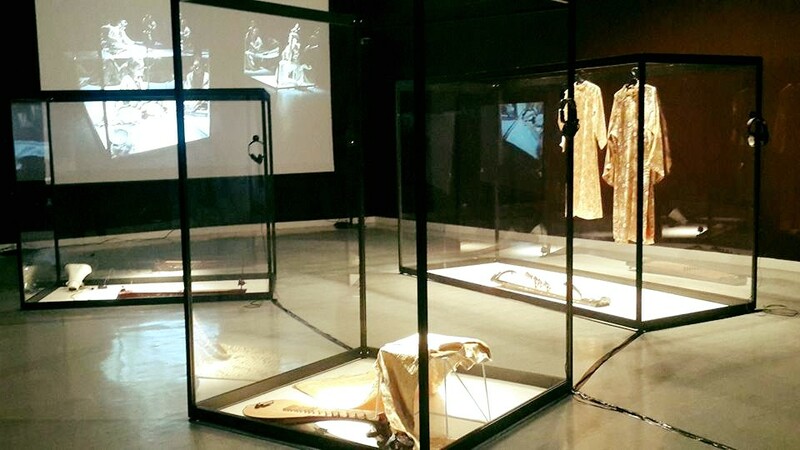 Building on an analysis of gesture in the performance of traditional Vietnamese music in TV-shows, the choreography of the performance merges with the music that creates a web of sound merging traditional Vietnamese music with experimental Western approaches. The performers were choreographed by the Swedish choreographer Marie Fahlin. The music was created by The Six Tones and Matt Wright. The first version of the piece was performed at the Kim Ma Theatre in Hanoi in October 2012. A couple of weeks I came across perhaps the most intriguing installation and performance of the year. It was at the Kim Ma Theater in a small, wood paneled, parquetry-floored performance area that was so inviting that any theater director visiting it would immediately start having day dreams about what they could use it for. On this occasion it was used for six, 45-minute-long performances spread over two days. 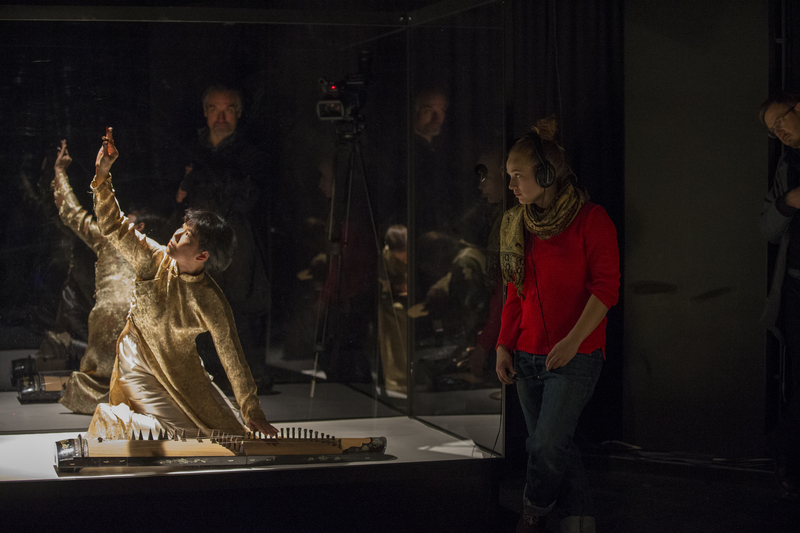 SCENARIO: you entered the darkened space and came across three large, spot-lit, perspex boxes and in each was a female posed motionless with a traditional music instrument. For all the world they looked like those miniatures of dolls in quaint folk costumes that you can buy up at airports and tourist shops in any city. You wandered freely around these boxes, their inhabitants clothed in traditional yellow costumes of Nguyen dynasty queens, perfectly still as if frozen in the act of plucking a string. At times as you looked through the boxes and caught reflections, an optical illusion sometimes made it appear that these queen musicians were both inside and outside their boxes. But wait!! One of the delicate and beautiful queens has a long, western masculine face, heavily stubbled. She has knobbly, large male fingers and enormous feet poke from the yellow tunic. You are startled, taken aback. One by one the musicians, like puppets or wind up dolls, start to play and the music swells around the dark room. If you put on a headphone attached to individual boxes you can hear that particular players chords. The music subtly changes and becomes more electronic, atonal and harsher on the ear and one by one perhaps puppet queens start to jerk and move in startling, intense choreographed dance. They rise to their feet as if beseeching the audience through unfocussed eyes. Solos are played in these strange new sounds and eventually the puppets subside to their complacent, compliant starting positions, hands poised motionless over strings, and I leave the theatre still dazed and dazzled by it all. Inside/Outside was staged again at the Inter Arts Center in Malmö, Sweden with performances on November 28 and 29 during the festival Tacit or Loud: where is the knowledge in art? 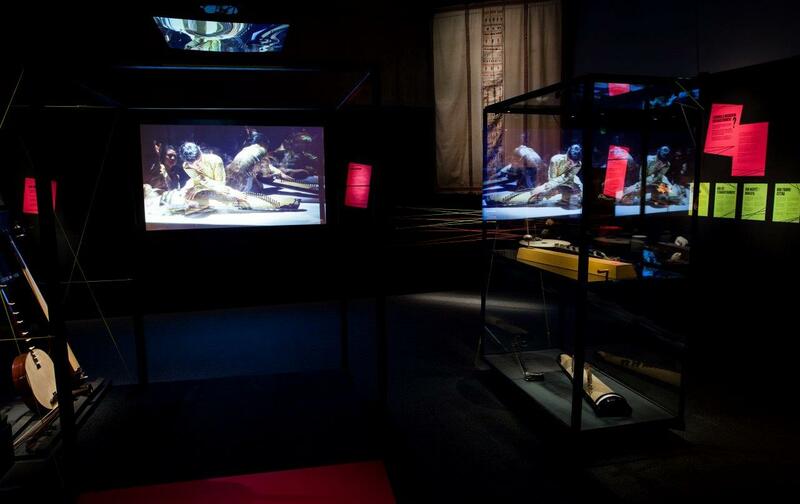 In this version, the piece is enhanced by the premiere of Post Human Computation a work by Pierre Jodlowski (FR) with video projected on one of the glassboxes in the space. 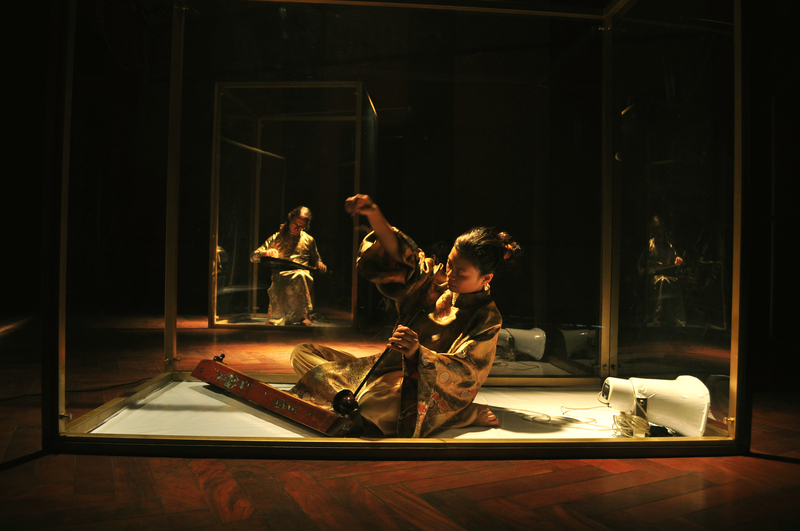 Inside/Outside was performed several times at the opening of the Cotic Arts Space in Hoi An, Vietnam in April 2015. In the end of October, the piece was performed at the Museum of World Cultures as part of the Planeta Festival. 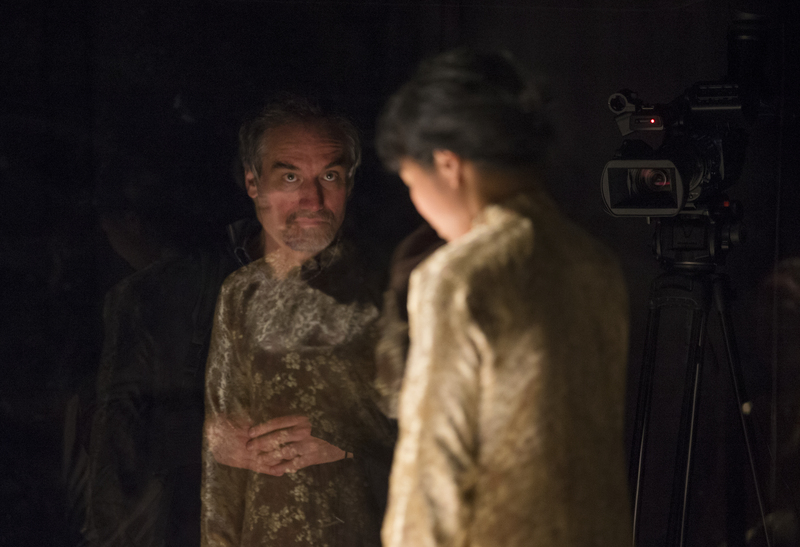 In November, Inside/Outside and Post-Human Computation were both performed at the Audio Art Festival in Krakow, continuing to the South East Asian Arts Festival in London. At the Sidney Cooper Gallery in Canterbury, Inside/Outside was screened in the film version and received a number of performances during the last week of November. This week I visited the Museum of World Cultures in Göteborg and was thrilled by the video and the music of your “Inside/Outside” project. Is there any possibility to get the Vietnamese music recorded on CD? I would be very grateful for any hint or resource! I would also be interested in a DVD of the performance with Vietnamese music, if available. The background for my interest is the development of (inter) cultural competence, and concert photography with a focus on “world music” (http://palma.smugmug.com). We are also planning a CD with the Vong Co, one of the two pieces we are “deconstructing” in Inside/Outside. The other is Da Co Hoai Lang, a piece which is featured on Nguyen Thanh Thuy’s first solo CD as well as in a number of versions on the double CD with The Six Tones titled “Signal in Noise”. thank you for the information that helps me pursue the ideas of your project. I would be grateful for an E-mail if or when your DVD project has been realized. The YouTube video puzzles me and challenges my ideas about how the visual and the tonal can be combined in one experience. this is a pertinent comment. Inside/Outside was originally conceived as a performance/installation. The idea of a video installation version came up in 2014, and here the three headphone tracks (which are also presented to the audience in a live performance) have a strong role in creating the multiple layers that the piece should evoke. How to represent the piece as a single video/audio stream is a good question. We are considering to put a web version up where the audience can shift perspectives between four audio streams.